^ Horowitz, Gary T.; Polchinski, Joseph (2006). "Gauge/gravity duality". In Oriti, Daniele. Approaches to Quantum Gravity. Cambridge University Press. arXiv:gr-qc/0602037. Bibcode:2006gr.qc.....2037H. ISBN 9780511575549. OCLC 873715753. ^ Isham, Christopher J. (1994). "Prima facie questions in quantum gravity". In Ehlers, Jürgen; Friedrich, Helmut. 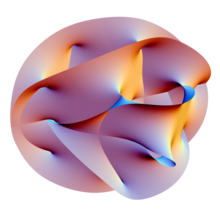 Canonical Gravity: From Classical to Quantum. Canonical Gravity: From Classical to Quantum. Lecture Notes in Physics. 434. Springer. pp. 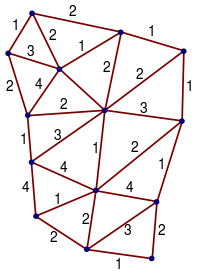 1–21. arXiv:gr-qc/9310031. Bibcode:1994LNP...434....1I. doi:10.1007/3-540-58339-4_13. ISBN 978-3-540-58339-4. ^ Hawking, Stephen W. (1987). "Quantum cosmology". In Hawking, Stephen W.; Israel, Werner. 300 Years of Gravitation. Cambridge University Press. pp. 631–651. ISBN 978-0-521-37976-2. ^ Hossenfelder, Sabine (2011). 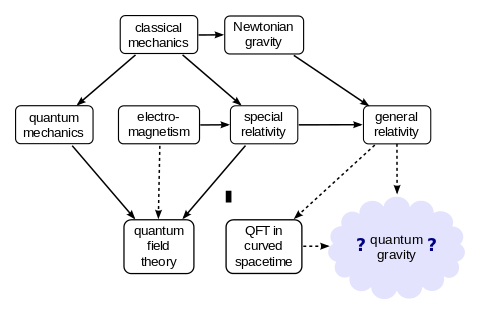 "Experimental Search for Quantum Gravity". In V. R. Frignanni. Classical and Quantum Gravity: Theory, Analysis and Applications. Chapter 5: Nova Publishers. ISBN 978-1-61122-957-8.